Hackbright Academy software engineering fellow Nicole Ziemlak graduated in March from Hackbright Academy and is now a software engineer at Minted. Check out her interview with Hello Web App below to learn more about her experience! I majored in literature and creative writing in college, and then taught high school and GRE test prep for a couple years before eventually moving to San Francisco. I’d always been interested in technology from a consumer’s perspective, but being surrounded by so many developers inspired me to try creating my own programs. I took a job at a non-profit organization that partnered with some major players in the industry (e.g. Microsoft, Intuit, Symantec), hoping that I would be able to teach myself programming on my own and maybe move into a more technical role. What inspired you to learn programming? In my search for resources that could bridge that gap between programming knowledge and a fully-fledged web application, I stumbled upon coding bootcamps. There are quite a few in San Francisco, so I attended a few info sessions and started my applications. When I went to visit Hackbright Academy, I knew I had found my top choice: this program had great placement statistics; the instruction was based in Python, which was my favorite of the languages I’d been learning; and the cohort was entirely female. The gender disparity in tech is something that both fascinates and frustrates me to no end, and Hackbright seemed like the best way to find a network of talented, intelligent women that would all be working in the same male-dominated field. Nicole pictured with Joel Burton, Hackbright Academy’s Director of Fellowship Education, and fellow Hackbright classmate Daria Lee Garnia. 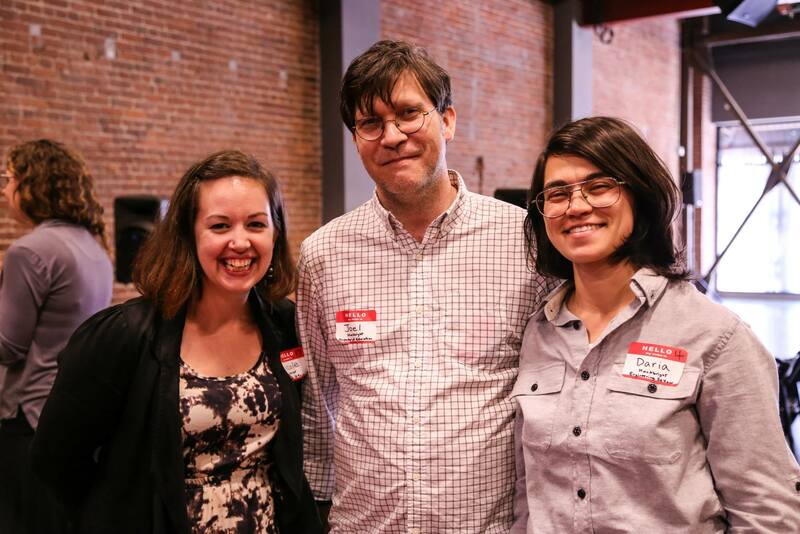 Tell me a little bit about the Hackbright Academy experience! Anything cool you’ve built or would like to mention? My final project is a recipe management app called Chomp! and you can check out my code and a fairly extensive walkthrough in my Github README. I just accepted a position as a Software Engineer at Minted and am looking forward to learning about programming larger-scale web apps on the job! You can read the full interview in Hello Web App’s new series profiling programmers!